In 'Sherlock,' A Classic Sleuth For The Modern Age Sir Arthur Conan Doyle's Victorian world is set on a 21st-century stage in Sherlock, where Holmes still lives at 221B Baker St. -- but now he's next-door to a sandwich shop, and Dr. Watson is a blogger. 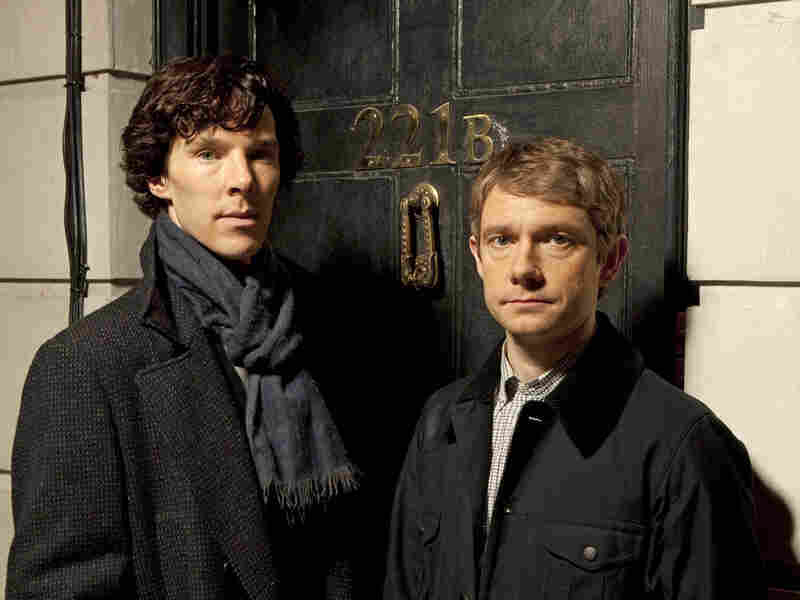 Benedict Cumberbatch (left) plays Sherlock Holmes -- of London's 221B Baker St. -- opposite Martin Freeman's Dr. Watson. Brace yourself for a very updated Sherlock Holmes. A new BBC series called, simply, Sherlock, has been garnering acclaim in Britain for a while now, and its first episode is set to air on PBS's Masterpiece in the U.S. on Oct. 24. The series is a 21st-century adaptation of the Victorian world of Sir Arthur Conan Doyle's fictional detective, and co-creator Steven Moffat tells NPR's Linda Wertheimer that there's good reason for the change. "It seemed to somehow make it a bit less reverent and a bit more fun," Moffat says. "Much as we love Sherlock Holmes, we love Victoriana. Many of the adaptations become about the period as opposed to about the story." Moffat says Sherlock Holmes' original world lent itself quite well to modernization. "If you map the original stories onto the modern world," Moffat says, "the parallels are so exact and so simple that it tells its own story." That's in part because Doyle wrote Holmes as a chronically curious character. So it makes sense that a perpetually inquisitive detective would actually feel quite comfortable in the information age. "He was born for the Internet and for the chat room and for forums," Moffat says. "I think he'd love it. It would finally be the speed and the intensity of information that that demented man craves." Though the original stories may lend themselves to Sherlock's uber-contemporary adaptation, many Holmes fans are still uncomfortable with the revision. To them, previous representations of Sherlock Holmes should not be messed with. 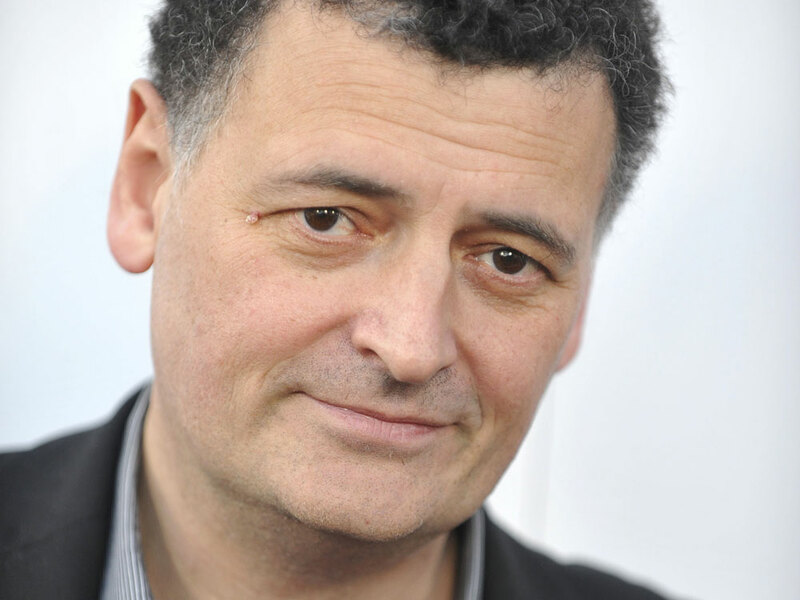 Steven Moffat is the co-creator of Sherlock. He's also the lead writer and executive producer for the British science-fiction TV show Doctor Who. "When this show was about to air in Britain, a lot of people were saying those things -- 'It shouldn’t be updated. No one can beat Jeremy Brett. No one can beat Basil Rathbone,' " Benedict Cumberbatch, who plays Sherlock Holmes in the new series, tells Wertheimer. But Moffat explains that the series is not trying to outshine any previous renderings of Holmes. "While [Jeremy Brett] and Basil Rathbone have my vote as the all-time greatest late Victorian Holmes," Moffat says, "there's enough originality in what I give and what Stephen [Thompson] and Mark [Gatiss] have written for it not to tread on the hallowed turf that is Jeremy Brett." Another thing that's different about this series is its depiction of Holmes' relationship with Dr. Watson (played by Martin Freeman). In Sherlock, Watson is a military doctor injured in Afghanistan, and he comes to Holmes looking for adventure. "It’s a man who misses the theater of war -- the excitement, the adrenaline and the danger -- and sees through Holmes' eyes, in Holmes' London, a new theater of war and a new battle to take part in," Moffat says. Holmes is happy to have Watson along for the ride because, unlike the Watson of earlier adaptations, this series' Watson is fairly intelligent. More importantly, he is dependable. "I think the defining thing about Dr. Watson in all his incarnations is that he's the first man a genius would trust," Moffat says. "Sherlock sees a reliability and a complete trustworthiness in this honest, good man." Watson may be moral and trustworthy, but Holmes remains the brains behind the operation. In the original stories, Holmes is able to make acute deductions at lightning speed, and for Cumberbatch, replicating that signature sharpness onscreen was a definite challenge. "There's no thinking time at all," Cumberbatch says. "As an actor, it's quite tricky because obviously you have so many details and you have no time to think what the next thing is. It has to come out at a machine-gun speed." According to Moffat, Cumberbatch's success at mimicking Holmes' mental agility is part of what makes Sherlock a worthwhile series to watch. "It's one of the defining things about a good Sherlock Holmes versus a bad Sherlock Holmes," Moffat says. "Can you do all that stuff without just sounding like the smuggest git in the world? ... He's got to sound like someone who's just high on the fact that he's clever." Moffat promises that more Holmes-related work is on his radar, though the only details he would offer were: "Adler, Hound and Reichenbach." That's a mystery for most of us, though Sherlock Holmes would probably decipher it in seconds.